22 Dec New Year, New Goals? Almost everyone I know is setting new goals and new aspirations for 2018. Unfortunately, most of them will fail!! 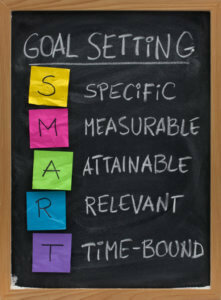 This won’t be down to a lack of intent, but rather a lack of understanding regarding how to set goals properly. During our personal trainer courses, we spend a lot of time focussing on goal setting, how to set goals with clients and the importance of setting goals accurately and properly. In 2009, I completed a Master’s Degree in Performance Psychology looking at Sport, Exercise, Team and Group psychology, I have a lot of passion in this area and I value the importance of setting goals accurately and thoroughly. I have lost count of the amount of times I have seen and heard family members, friends and clients conform to other people’s aspirations and expectations because they feel it is the right thing to do. This is wrong! Goals should be personal and based on what you want to achieve not what others want you to achieve. If your goals aren’t personal then the likelihood of you committing to them achieving them are low. S – Specific. Similar to the above, goals should be specific to what you want to achieve. Don’t conform to other’s expectations, but set goals you want to achieve for personal reasons. M – Measureable. Goals should be measureable so that you can monitor their achievement; for example, during our personal trainer courses we urge our students to take measurements at day one with clients such as body fat percentage, weight, V02 max or 1 rep max tests so that they can be re-measured down the line to see if the client was successful or not. A – Achievable. When you set a goal, don’t set yourself up to fail. Set goals which are challenging but also achievable. *Note the word challenging. If goals aren’t challenging then there won’t be a sense of satisfaction once you achieve them. R – Realistic. Do you have the resources and capabilities to complete the goal? Similar to achievable, make sure you are realistic. T – Time bound. Always set an achievement date for your goal, that way you are committing to it and are more likely to achieve it. ‘A goal without an achievement date is just a dream’. If your goal is life changing, recruiting family and friends to support you is crucial. An example of this is someone who has been diagnosed with Type 2 Diabetes and Obesity. To change lifestyle habits can be challenging. But, by recruiting loved ones, family and friends for support you are more likely to succeed. As well as this, by placing reminders in strategic places such as a sticky note on the biscuit tin, a sticky note on computer at work or a reminder of your goal to appear every morning on your phone, you will be more focussed and likely to achieve your goal. The above are only suggestions on how to improve the likelihood of succeeding and achieving your 2018 personal and career based goals. This is the process we teach during our fitness qualifications and is one of the reasons why Fitness HQ qualified personal trainers get great results with their clients. I hope you found this article helpful and useful, please don’t be afraid to follow these guidelines and I’m confident you’ll achieve far more of your goals in 2018. From everyone at Fitness HQ, we’d like to wish you a Very Merry Christmas and a Great New Year!